Are Your Future Profits Going 'Down the Crack'? Little "ooops!" add up to big future problems. Many tanker truck loading or unloading site managers have far bigger problems than to chase after careless workers who set up spills and accidental releases. Some of the most common errors are breaking hose connections while the hose is still under slight pressure, or "cracking" a valve just to see if the pipe is full, or even throwing aside a "just used" hose and allowing it to drain out on the grass or driveway. Unfortunately, the real cost of this carelessness often doesn't hit the company until many years later, when the EPA or other agencies detect contamination in the subsurface water down gradient from your facility. Back in the mid-80s, as manager of facility planning for Safety-Kleen Corp., I was leading a management team evaluating a possible site for a regional truck-to-rail used motor oil transloading operation just north of New York City. On the surface, the site had a good-condition railroad spur track, plenty of flat land to build tanker truck parking, and good access to major feeder highways around the city. As was our practice, our investigation team member environmental staff shortly after hired a well drilling firm to place sample wells and then do a detailed analysis of what it found. The analysis showed excess quantities of tannic acid. This triggered both our environmental staff and the state's staff to attempt to find the source of this contamination. Further research uncovered that a leather tannery had been closed about 20 years earlier and it was over five miles up gradient from these current sample wells. Spills from processing vats and/or tainted surface water from tanker unloading operations had slowly migrated from surface water down into the immediate subsurface aquifer and continued its slow flow for years. In yet another incident close to Kansas City, Kansas, we were evaluating a possible used motor oil truck-to-rail transloading site owned by the (then) Santa Fe Railroad. Upon sinking sampling wells and detailed sampling of the water, we recorded high concentrations of insecticides and pesticides. This made it much simpler to identify the source. A large agricultural chemical company had their regional warehouse about a half mile up gradient from this potential transloading site; they apparently had spills or just washed inside spills out the door or loading dock ramps. We continued our search elsewhere. At all transloading sites or plant loading racks, concrete slabs are usually poured to contain any releases from that operation. Unfortunately, these slabs get tainted with spilled chemicals and/or oils, and local rainwater gets contaminated upon contact with the slab. The big question here is how good of a barrier is this concrete pour? A quick review of conventional concrete pouring is in order. Most concrete slabs are poured over a compacted bed of crushed rock or small pebble "river rock" and sand. This underlayer is a very porous "sponge" for any liquids that get down through cracks in the poured slabs. Because of thermal expansion and settling, usually tar based expansion joints are set in between poured sections of the truck-loading containment basin. These joint should be regularly inspected because this "down the cracks" is one primary way contamination gets into the groundwater and starts its migration. If these built-in expansion joints are loose or have been deteriorated by years of hot sun on the containment basin slab, they need to be replaced with new materials that can stand up to whatever materials that may be released onto this basin. If you decide to replace these expansion joint seams, they need to be cleaned out of all sediment and former expansion joint material. A pressure blast (compressed air) should be used and a simple wood rasp used to clean both sides of the grooves. Next, use a quality epoxy glue and "butter up" both sides of the groove to a depth of at least 2 inches. Depending upon the width of the cleaned groove, select a replacement material. I've had excellent results using conventional "backer rod" used by brick masons to repair weakened masonry joints in brick walls. Select this closed cell polyethylene "foam" rope so that when it is compacted into the groove it will be flattened by 50 percent. If the cleaned groove is ½ inch wide, then purchase ¾ inch diameter "backer rod." Push this rope down into the "buttered" grove so it is lower than the normal wear surface. You may want to top this polyethylene foam rope later with a standard concrete caulking material. While the previous discussion on loading rack slabs may be part of your solution, let's take another look at the expense of "casual" releases. There's a quip in the environmental business "Dilution is not the Solution to Pollution!" What about the tainted rainwater or the usual "just hose it down water" that ends up in your loading rack's drainage storage tank? The more rainwater that is exposed to your tainted truck loading slab, the more tainted water you have to pay to process. Doesn't it make dollars and sense to capture the release BEFORE it hits the slab? This is where real effort is needed to reduce your monthly disposal expenses and stem long range expenses from "down the crack." Using adequate spill containment is the key. (Note in the photo.) A tipsy 5-gallon plastic pail is a poor spill containment tool. 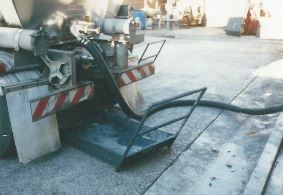 Just the manual movement of the delivery hoses will tip it over onto your slab. A wide-based collector pan would be much better but, here again, a "sawed-off 55 gallon drum" or wash tub with a few gallons of "spill" in it is difficult to move around (for emptying) without spilling it on the loading rack slab. Another likely groundwater contamination area of your transloading operation is your railroad trackside. The loose ballast placed there by the railroad construction is in fact just another "gravel stream bed" at the surface. The primary purpose of the ballast mound of loose gravel is to allow rainwater to quickly drain away from the wood ties and to allow the ties to absorb the extreme weight variations caused by a passing tank car wheel. This ballast bed, under the ties, may be 2-3 feet deep and goes continuously out to the railroad's main tracks. Spills originating from broken hose connections or overflows will travel "the path of least resistance." This situation, too, can be avoided by having railroad track spill containment pans along the railroad rails at the loading racks. The vast majority of releases happen within about 5 feet of the bottom hose connection or the overhead dome area. The releases or overflows will run down the outside surface of a tank car and will drip off about any time. The personnel ladder up to the tank car's dome control area often causes this "rundown" to spray outward, way past the rails. There are many designs of railroad track spill containment pans. The "initially" cheapest approach is to purchase open pans. These will collect rainwater, contaminate it with residue in the collector pan and then drain into your holding tank and greatly add to your operation's disposal costs. A much smarter approach would be to purchase both between the rails and outboard of the rails collector pans that can be closed up between loading operations. A typical open track pan installation may be 12 feet wide by 20 feet long. For every 1 inch of rain over your rail transloading rack, you'll collect 150 gallons of contaminated water that needs to either be processed on-site or hauled off by a contractor. Check with you local weather office to find out your annual rainfall and then do the math. Are you really saving money by purchasing open track pans? Another weather-related spill containment issue is snow and ice accumulation. The labor invested to shovel off a truck loading rack spill containment basin or to chip out the ice from a frozen railroad track pan is a sizeable labor expense. How often each winter do you have to do this? After each storm, how many manhours each are invested? Often the practice is to just shovel the "tainted" snow and ice off to the outside of the containment and let it thaw with the spring weather. Now, where do you think that tainted meltwater will go? These types of environmental surprises and liability may be averted by careful review of your tank car and tanker truck loading or unloading facilities. Nearly all leaks, overflows, broken lines/hoses, etc. involve chemicals/oils that should not get into our streams and drinking water sources. The legal ramifications of these "oops" events will definitely affect the companies’ bottom line but some of the damage may not be "seen" for many years. You may think that spill control and groundwater contamination is a small issue, but ignoring it will be just putting your profits "down the crack."